Le titulaire de la Chaire est M. George Janelidze, professeur à la University of Cape Town et académicien de la Georgian National Academy of Sciences . "From Galois theory to commutative Hopf algebras and finite topological spaces"
These lectures are about Galois theory, which begins with field extensions, makes several steps of wide generalization, and eventually arrives at a purely category-theoretic level, where it gets new motivation and many new expected and unexpected examples. 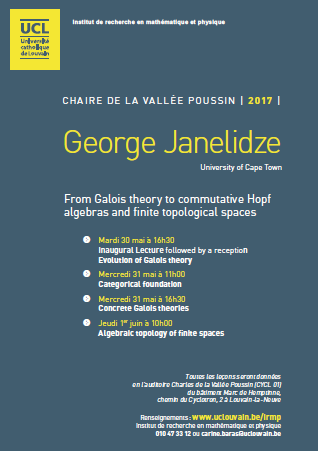 These examples will be described, with special remarks on commutative Hopf algebras that appear as Galois groups, and the whole last lecture devoted to algebraic topology of finite spaces, where the Galois theory of covering spaces works especially well. La leçon inaugurale aura lieu le mardi 30 mai à 16h30. Les leçons suivantes auront lieu le mercredi 31 mai à 11h et à 16h30, et le jeudi 1er juin à 10h. We will follow the evolution of Galois theory from the moment when it entered the world of abstract algebra to the moment when its so-called Fundamental Theorem was made purely category-theoretical. Inevitably, this will involve general remarks on ‘Eilenberg – Mac Lane paradise’ versus ‘Cantor paradise’. Galois theory in general categories is an example of what looks very sophisticated if its categorical foundation is not taken seriously. The purpose of this lecture is to say that category theory has its own classics, even though it was developed less than 100 years ago, and to show how some of these classical ideas and results make Galois theory simple and natural. The abstract Galois theory not only unifies the known cases, but also produces new ones; those studied so far will be listed, and some intermediate levels of generality will be considered. In particular, this will bring commutative Hopf algebras to our story. We will also mention various open questions. It is well known that a large part of algebraic topology can be developed by means of finite spaces. The main purpose of this lecture is to show how categorical Galois theory of covering spaces supports the idea of using them. chemin du Cyclotron, 2 à Louvain-la-Neuve.